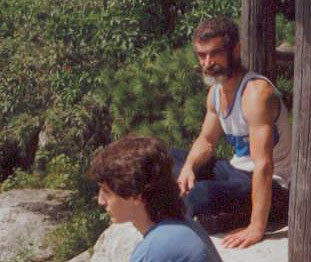 Arthur Joseph Kushner pictured above at right with his longtime friend Bram, in the Shawangunk mountains near New Paltz, New York. Photo provided by ArthurJoseph.org. My last conversation with Arthur Joseph Kushner was a few weeks ago, when I called him up for some advice about a writing project. In the years since I've moved away from the Hudson Valley, that was how I kept in touch with him; no matter what subject I asked him to comment on, he would widen, deepen or flip upside-down my point of view. Cell phones and the fact that his home number was one digit off from Chronogram's made it extremely convenient to call him at any reasonable hour. On October 1, Arthur died of heart failure in New Paltz at age 55. That this strange news arrived at the end of one of my most awesome days of connecting with the Seattle community somehow fits, because he was one of my deepest roots into New Paltz and the Hudson Valley, the most recent place my body and soul agreed was home. People always make a place home. Mountains, mystical cement mines and wild journalistic adventures hereby acknowledged for the color that they bring to life, people are the foundations and beams of a place. I treasured Arthur, welcomed his teaching and his influence, and accessed his mind as often as possible. He was always willing to share his ideas or go trekking on the cosmic waves to wherever we might arrive. It is sad and unbelievable that I won't stand as if time had stopped on the sidewalk outside the Main Street Bistro, and hear his resonant, musical voice again. He bore what I consider to be the true mark of God: anything, no matter how serious, somber, or important, was good for at least one laugh, usually more. At the least, Arthur supported my hallucination that, as a Sicilian from Brooklyn, I am an honorary Jew. Among other major philosophical issues, Arthur had solved the riddle that is the often highly troublesome question, "How are you?" He always had some variation on the same anwer, and it would surprise me a little every time, no matter how many years went by. "Hey Arthur, how are you?" After hesistating and pondering for a few moments, he would reply, ever-optimistically: I'm doing some of the right thing. Our paths first crossed within days of my arrival in New Paltz in the autumn of 1989, at the open poetry readings that were, at the time, one of the defining aspects of New Paltz cultural life. Here was this bearded woodsman, a rabbiesque beat poet, classical bard, martial artist, scholar and community organizer in one person, who would sit penning his ideas into crinkled scrolls of paper he carried in his knapsack. Arthur, along with Richard Rizzi, Maryrose Larkin, Ron Whiteurs and others, formed no less than a full-on literary movement that incarnated at the Rosendale Open Space Cooperative in 1990, taking over numerous bars, cafés and a pizzeria along the way. At those events, Arthur's work lent a ritualistic and at times breathtaking quality to the atmosphere. One of his poems, about an elephant hunt, performed before an enormous silhouette of the beast created with a paper cutout and a flashlight, was so vivid I can still taste the elephant's fat. I wondered that night and every time I remembered the poem whether he actually took part in an elephant hunt. I never asked, but he had a quality particular to an authentic shaman, which is that he could shift forms in space and time, pick up distant signals and infuse himself with the energy of almost any culture. No matter what he did, his simplest gestures had the quality of high ceremony. I have a vivid memory of watching him split wood with the intention and precision you might expect of a diamond cutter. I could feel the force of his arms move through the hatchet and divide the log. I can still see his eyes measuring the alignment of the strike. He loved and had an odd mastery over sharp objects: daggers, axes, ceremonial knives, swords, ordinary knives. He wielded his mind with the same precision. He was one of our community's most dedicated and effective leaders of ritual and ceremony. His sweat lodge ceremonies were so clear and so grounded in Native American tradition that he had the personal blessing of Charlie Thom, the Karuk Indian leader of California's Kalmath River region, with whom he shared a long friendship. Arthur was also closely involved with the Tanio tradition of Central America, and was deeply learned in Hindu mythology, the work of J.R.R. Tolkien, most any poet you could name, and of course Jewish mysticism, Kaballah and the Tarot. His rabbi, Bill Strongen, consulted him regularly for advice on his sermons. Strongen once remarked that he left the deepest levels of Jewish mysticism to those who were not afraid to take a trip into the dimensions from which one might not return. Arthur had no hesitation. He possessed -- and shared -- an astonishing gift for moving between myth, metaphor, symbol and tangible reality. I have worked with some pretty amazing teachers but can think of no other who could hold awareness on so many levels simultaneously, then show you something in your hand, or draw a picture, or tell a story that made the point clear and concrete. He was born August 8, 1947, The Day of Role Players, sharing a birthday with Dustin Hoffman. The 8 of both the date and month invoke the Tarot card Strength, which depicts a lion and is associated with Leo. "Each change, each new role is painstakingly studied so that success may be assured," writes the Secret Language of Birthdays by Gary Goldschneider and Joost Elffers. "It may be astonishing to others, and even to August 8 people themselves, how fully they have played a given role, particularly looking back from a later vantage point, or after subsequent changes." Like Hoffman, he fully embodied his roles rather than played them. For those who follow astrology, his chart is 8 degrees Cancer rising, with an Aries Moon and the Sun, Venus, Pluto and Saturn in Leo. That's a lot of Leo, which means perpetual child, and also a regal quality that I never thought of in those terms until now. His physical comportment was one of impeccable posture, awesome strength and a sense of pride that compelled him to ignore the advice of his cardiologist. Though he was diagnosed with heart disease seven years ago, he didn't get the prescriptions filled. His death chart exemplifies his sense of precision and appropriateness of symbol. The day of his death, the Sun (the ruler of Leo) was exactly conjunct his progressed Sun and natal Neptune, all within one degree. At the moment of his death, the degree rising was closely approaching his natal degree rising, and Chiron -- the planet of shamanism, often said to represent a 'wounded healer' -- was exactly, again to one degree, crossing the western horizon, which it does for four minutes each 24 hours. The west represents the angle at which we meet people, or entities, in the most personal relationships; Chiron's prominence in the chart shows up like a kind of angel at the threshold. It's very strange to think that he won't be there to walk me through complicated ethical questions of Middle-East politics, Tarot interpretation or the incredible power of the Internet. It's worth mentioning that he was certain this tool was having a vast, critical and as-yet unrecognized impact on the ability of people to move information for the cause of world peace and power to the people. He compared it to the short wave radios left (ostensibly for emergency use) by Christian missionaries in mountain villages high in the Andes, which he said transformed politics and culture in the region. Suddenly these people living on distant mountaintops could talk to one another. The most recent time I needed his help, I was assigned to stand in for the daily horoscope columnist Jonathan Cainer in the London Daily Mirror on Sept. 16, Yum Kipur. I decided, knowing Arthur would be happy to back up my plan, to mention the Jewish holiday in the 'thought of the day section', which is about 125 words. The problem was I needed something short. Today is Yum Kippur, the day of atonement in the Hebrew calendar. Since astrology is a system with a deep root into ancient mysticism (Kaballah), this is worth mentioning. The old definition of atonement is acknowledging one's shortcomings and making amends for them, and at Yum Kipur, we do this in preparation for the year ahead. The modern definition is at-one-ment, acknowledging one's wholeness and interconnection to all that there is. I think the link between the two definitions is perfect for our era, because our greatest sin is failing to see that we're one human family living in one world. And we do indeed have a lot of atoning to do for our society's desperate obsession with violence and warfare. More information and an ideography-in-progress is being developed at www.ArthurJoseph.org. There is a reading of Arthur's work being held in New Paltz at 1 p.m. Saturday, Nov. 2, 2002. Check the web site for details.